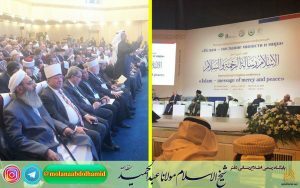 The official website of Shaikh Abdol-Hamid, president of Darululoom Zahedan and the most influential Iranian Sunni scholar reported that the conference has been kicked off in Moscow. The conference has been organized by the Muslim World League with cooperation of Islamic Affairs & Iftaa Organization of Chechnya. The concluding meeting of the conference will be held in Grozny, capital of Chechnya on Saturday 30th March. Dozens of scholars, intellectuals and Ulama from different countries take part in the conference. Shaikh Abdol-Hamid has been invited officially by the organizers. There are many alumni of Darululoom Zahedan, Iran, in Russia providing religious services to Muslims including teaching Islamic sciences and the noble Qur’an. According to a statement of the conference organizers, the attendees will discuss four major issues in the conference; pillars of coexistence in Islam, Russian Muslims and peace, Muslims and civilized interaction, and countering terrorism and extremism.